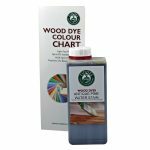 Fiddes Pine Water Stain - Goosebay Sawmill and Lumber, Inc. Application: Use a soft cotton cloth or sponge and apply in the direction of the wood grain where possible. Apply evenly, blending the stain over the whole surface area by exerting a degree of pressure when applying by hand. Water stain may also be applied by spray technique. Because these water stains are concentrated, you may find that one-half strength will be your most used ‘shop’ mix, providing versatility and economy. Thing with water for a lighter shade. On areas where exceptional evenness of color is required, a prior coat of Transparent Shellac thinned with two to three parts of alcohol (see Shellac) can be applied evenly, left to dry for one hour, followed by the application of water stain. The thinned shellac will act as a slight barrier and conditioner for the color work.